Mike Chadwick, promoter of the Band on the Wall introduced 'Nik Bärtsch's Ronin', saying he was well chuffed to get the band to Manchester for their first gig in the city, and we were too. T'was another grand night. They call it 'zen funk', and I guess that's about right. I'm thinking the even meter lines of Steve Reich and Philip Glass sitting on a cool groove, so I reckon that's about the same kinda thing. If you're into your modes, think lots of dorian with a dash of melodic minor. Andi Pupato's especially esoteric percussion set-up was an impressive sight, and he made great use of the range of sounds, all seasoned with some tasteful reverb. 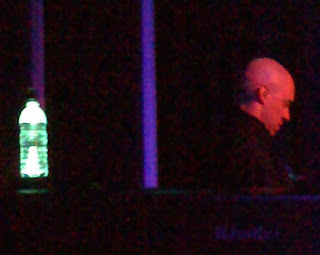 The other worldly Nik Bärtsch looked suitably zen-real, swaying slowly back and forth as he tapped out the spatial piano patterns, sitting behind a carefully placed fluorescent water bottle. Björn Meyer on the six string electric bass was really something else kicking out his complex lines, but always with a great sense of feel and groove. Kaspar Rast's gorgeous lazy feel on drums meshed nicely with the bass, counterposing the tight piano structures and thus giving rise to Ronin's distinctive sound. 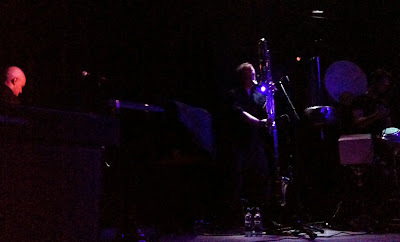 Sha on bass/contrabass clarinet was perhaps a little on the quiet side to my ears to make a decent judgement of his input, but when I could hear him in the quieter bits, it added a useful layer of harmonic meat to Bärtsch's lines. The subtle fluorescent green strip lighting effects were really quite engaging in a gentle sort of way. It's quite refreshing to see a bit of effort going into the presentation here, something you don't usually get on a 'jazz' gig. The sound also was really impressive again tonight. The deep bass thud from one of the drum percussion instruments really took your breath away, possibly being a shade too much for me, but it highlighted the power of the great sound system the Band on the Wall has to shift some air. Top night. Nice one Mike C.